We’ve just gone through the second day of the Mercedes-Benz Hungry for Adventure Festival, and we had a blast. Sure, there are plenty of cars to see and test drive, but there are so much more besides. Just to recap, the weekend event saw the launch of the locally-assembled GLC 300 4Matic Coupé, which retails at an indicative RM399,888 on-the-road without insurance. The brand new V167 GLE 450 4Matic is also being previewed here – it’s coming to our shores soon with an estimated price of RM633,888. Also available for public viewing was Stuttgart’s latest SUVs, including the standard GLC and the GLA. Those looking for more performance would’ve have their appetites whetted by AMG variants like the GLA 45, GLC 43 and 63, GLE 43 Coupé and the biggest and most powerful of them all, the RM1.46 million G 63. Visitors were also able to test drive various Mercedes sedans, coupés, hatchbacks and SUVs – yes, AMGs too. As if all that wasn’t exciting enough, Mercedes-Benz Malaysia also brought along plenty of activities for families to enjoy, really ramming home the Hungry for Adventure theme. The flying fox and reverse bungee jumping were a must to experience (the latter was a particular eye-opener for yours truly), while the rock climbing and the Cycology virtual cycling challenge were a real test for fitness and strength. As for the kids, an inflatable playground and a miniature driving town kept them entertained, while food trucks were around to sate appetites. But that’s not all, as there was also something for music lovers to enjoy, including a freestyle rap and DJ battle which saw winners walk away with cash prizes and a chance to perform at the ongoing Hungry for Adventure Live concert. This concert, by the way, will see performances from Craig David presents TS5, BATE, MC VIBE, CZA and Electronic Theatrical Music. The concert is invite-only, with visitors having scored passes by taking part in an Instagram contest and test driving the vehicles at the event over the past two days. 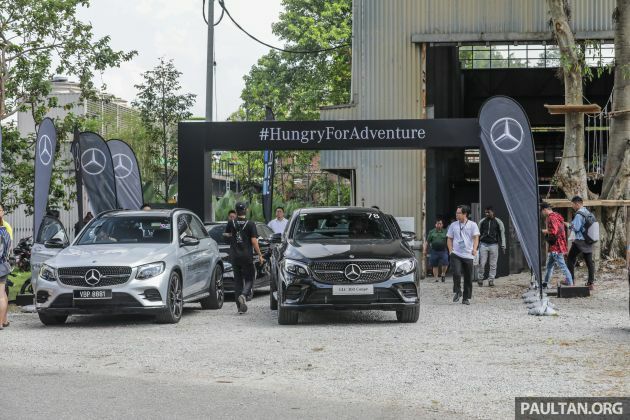 Don’t forget to catch the last day of the Mercedes-Benz Hungry for Adventure Festival tomorrow, March 23, from 10:00 am to 7:00 pm at Sentul Depot at Sentul West, near the Kuala Lumpur Performing Arts Centre (KLPAC). Admission is free. For more information, visit the event page on Facebook. The post Mercedes-Benz Hungry for Adventure Festival – taking you through the cars, test drives and activities appeared first on Paul Tan's Automotive News. 0 Response to "Mercedes-Benz Hungry for Adventure Festival – taking you through the cars, test drives and activities"